It may seem that gray is a drab color to decorate with but it can really be quite striking when done right. I chose this color to highlight next because it is one of my favorite colors to accessorize with. It can also be a great neutral wall color as well. Think about nature or a stone in particular when you are choosing your paint colors. You can almost never go wrong when you try to replicate nature! Just check out the sampling of stones in the picture. It seems as though most all of the gray stone that I find has a touch of warmth to the color – some little specks of tan. If you look at many paint chips, you will find that some of the grays have a nice warm undertone. It helps to bring in an inspiration piece, such as a stone or a decorative accent to match up to your paint to pull the right color. A bathroom is a great place to get a spa like feel using gray. 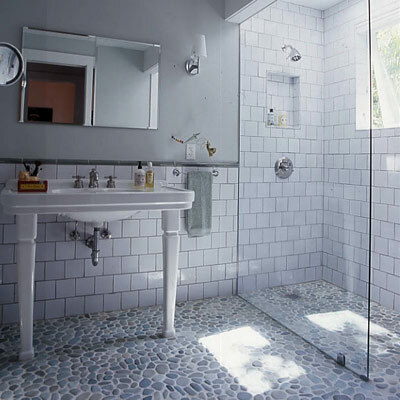 This is a fantastic example with the pebble tile floor and the soft gray walls all mixed with the clean white fixtures – a luxurious, natural spa feeling! A dining area looks especially cozy and classy with a brick wall done in gray. 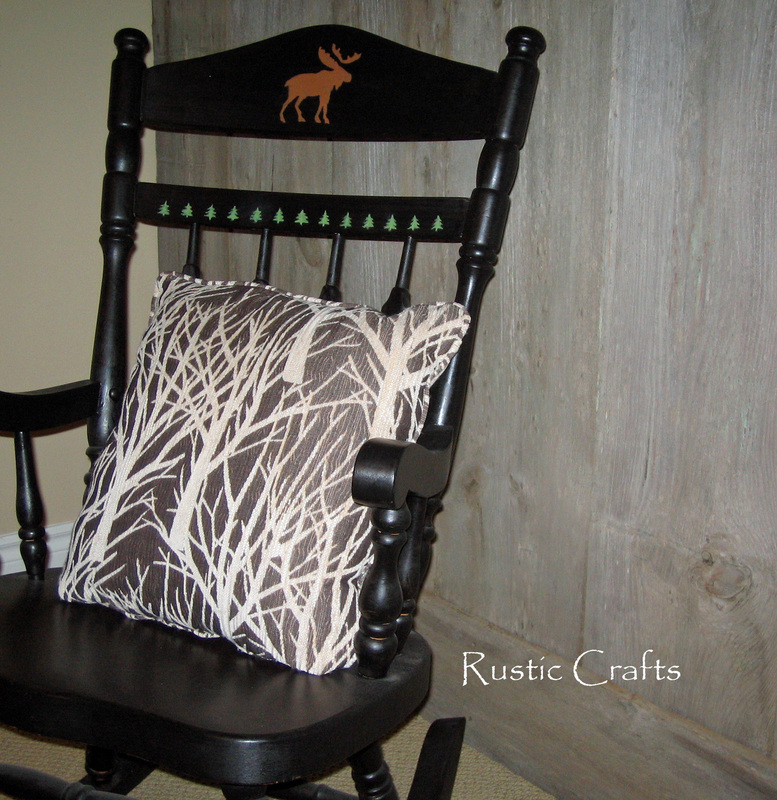 It makes a nice setting for some rustic lighting and other accents. Check out how nice all these shabby chic accents look against the warm gray wall! The natural colors of the twigs, baskets, and deer heads all bring our the warm undertones of this gray color. 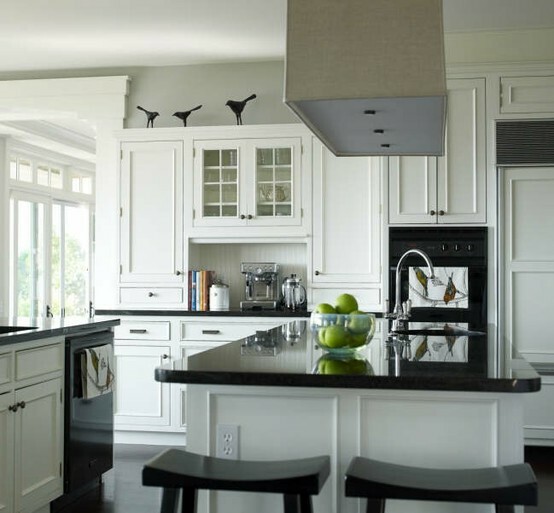 I love gray walls in a kitchen, especially if you have a lot of stainless steel and other metal accents. Typically, when you think of decorating a nursery, pastel colors are probably what come to mind. 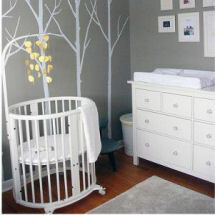 However, I think this gray and white nursery with the tree motif is so precious. Plus, it is perfect for either a boy or girl! This taupe gray bedroom is super soothing and beachy feeling especially with the complimenting wide plank wood floor. What do you think of decorating with gray? Would you use it in your house? Leave me your thoughts and comments!